Recently, while on vacation, my wife and I went to see the Dead Sea Scrolls exhibit at the Franklin Institute in Philadelphia, Pennsylvania. For those who don’t know, the Dead Sea Scrolls are the oldest known writings of the Old Testament of the Bible in existence. They are roughly 2000+ years old, and written in a variety of languages; plus, the story of their discovery and excavation is quite fascinating. 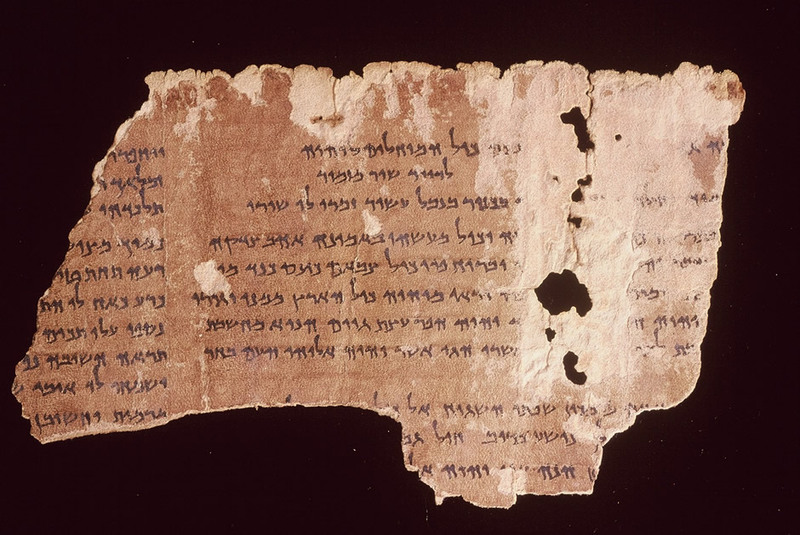 The Dead Sea Scrolls themselves give differing, and even contradictory, accounts of various Old Testament Biblical stories. That is, they are not even consistent within their own writings, and these are the earliest (and therefore most original) Biblical writings we have! Why would this be, if the Bible is supposed to be error-free? The answer is simple, yet difficult for some to accept: the scholars who have painstakingly analyzed the scrolls for decades have found that these writings were written in a variety of different communities by a variety of different authors (most likely local priests or community leaders). As a result, each author had their own “spin” they wanted to place on various stories, which led some accounts to conflict with other accounts. The conclusion is obvious: far from being inerrant in nature, the Bible is, and apparently always has been – even back unto the days of the Dead Sea Scrolls before “The Bible” even existed – a work of wholly fallible humans. Wonderfully done, and well-timed. This is an especially important time for those of us in the non-believing community to step up and be counted, given the preponderance of religiously-oriented stupidity on display in election-year politics these days. If we hope to uphold church-state separation and fight back against those who would turn our secular republic into a theocracy, we need to get vocal and get active! The Center For Inquiry/Chicago invites you to our multi-media, participatory, Fall extravaganza! Mark Twain “in person”—Warren Brown, a nationally renowned Twain scholar, will perform as Twain, Huck, and Jim, the runaway slave, and will illuminate their views on science, humanism and slavery. A Q&A discussion will follow the performance. Davis Schneiderman, a thought provoking multimedia author, college professor, and editor will read sections from his new book: “Drain. Miki Greenberg of “It’s A Girl” will mobilize us with his satirical songs. Poetry Slam! Write your own verse and then sign in with Davis Schneiderman, the host! Be ready to present! As always with a Slam, everything goes: reading, reciting or singing your poem/song, in costume or in plain clothes. Use your creativity, but stay with the theme, “On Deities, Doctrines, Superstitions and Other Things to Die For.” Be prepared—in keeping with the Slam tradition, the audience will express its admiration or disapproval of your wordsmithing! Food and snacks included with your admission. Cash bar is available for very reasonably priced drinks and soft drinks. Free street parking, public transportation is nearby, and bike stands are available. Click here to register online! Don’t miss this one! If you’ve never before been a Friend of the Center, become a Friend at $60 and pay only $7 more for this event—over half off! A multimedia artist and writer, Davis Schneiderman is the author and editor of eight books, including the novels Drain, Abecedarium, and the forthcoming blank novel, Blank: a novel. He co-edited the collections Retaking the Universe: Williams S. Burroughs in the Age of Globalization and The Exquisite Corpse: Chance and Collaboration in Surrealism’s Parlor Game; as well as the audio collage Memorials to Future Catastrophes. His creative work has appeared in numerous publications. He is Chair of the English Department, and Director of Press/&NOW Books, at Lake Forest College. As a pianist, composer and arranger for Maestro Subgum & the Whole, Miki Greenberg has been making music on Chicago’s underground scene since 1986. He co-founded the Lunar Cabaret in 1994 and is currently with the group “It’s A Girl,” working on his 16th album. Superstition, religion and things people die for were his obsession while working with his previous band, “Fetal Position,” as he continues to mix good entertainment with wit and critical thinking. For more information, please visit centerforinquiry.net/chicago or email chicago@centerforinquiry.net. I like to call this the “Google-of-the-gaps” logical fallacy, which is a humorous version of the classic god-of-the-gaps fallacy. Essentially, the god-of-the-gaps is a logical fallacy which is an argument from ignorance: it states that because we lack the knowledge to draw any kind of reasonable conclusion upon a particular question (such as life after death, for example) then in our ignorance some stat that God (or gods) must be the solution. Of course, the god-of-the-gaps is a silly argument to make, because with just a single change in wording, by substituting something else for the word “God”, one could argue that the explanation is Santa Claus, unicorns, leprechauns, space aliens, or numerous other silly things which are wholly unsupported by any evidence. We have all heard on numerous occasions about “the power of prayer” to heal the sick & dying. Stories abound about supposedly miraculous recoveries that are attributed to intercessory prayer – that is, prayer on behalf of someone else who is ill. Sadly, the reality is that the power of prayer… fails. Case in point: a couple in Oregon is facing jail for relying only upon prayer to cure their child of pneumonia. It seems that whomever they were talking to wasn’t listening, because the kid died. A US judge has rejected defence arguments that claimed selective and vindictive prosecution in the manslaughter trial of a couple whose 15-month-old daughter died of pneumonia while they prayed for her recovery. Clackamas County Circuit Judge Steven Maurer told lawyers for Carl and Raylene Worthington that he had already determined the Oregon City couple had a duty to seek medical care for their daughter, Ava, despite their religious beliefs. “There are limits, especially when it comes to the protection of young children,” Maurer said. The couple face manslaughter charges in the death of Ava, who died of pneumonia in March 2008. A state medical examiner has said she could have been treated with antibiotics. Now, don’t get me wrong here. Though I am an atheist, I can understand people wanting to pray to make themselves feel better in times of great stress, such as during the hospitalization of themselves or a loved one. I was in the hospital recently myself, and a colleague of mine called me – he told me that he’d pray for me, and I thanked him. I didn’t thank him because I thought his prayers would help at all (they don’t), but I instead thanked him because it showed me that he cared about me. But this is beside the main point of this entry. Sometimes people are turned off from science because they view it as a sterile & cold process. Often the argument is made that if one takes a science-oriented view of the world that it doesn’t necessarily foster a good moral life. Many argue that only religion, as opposed to science, can offer any guide for morality, ethics, and the philosophy of the good life. I think those critics of science are wrong. That is why I wanted to pass along a great podcast from the folks at Point of Inquiry which touches on all of these topics. On May 1st, D.J. Grothe interviewed Dr. Jeffrey Schweitzer about his book Beyond Cosmic Dice: Moral Life in a Random World.